Those looking to tune up their PCs should give a long look to the latest version of TuneUp Utilities. It does an comprehensive job of cleaning up your PC to make sure it runs faster, more smoothly, and without problems. This suite includes everything from a startup optimizer to a driver defragmenter, from an overall speed optimizer to a Windows Registry cleaner, and more. TuneUp Utilities 2010 ($50, 30-day free trial) adds new tools, such as Turbo Mode, which can offer an instant performance boost by turning off unnecessary background processes. TuneUp Utilities 2010 peers deep into your system, recommending changes to make it run more smoothly. As with previous versions, the program's overall organization and interface is straightforward. All of TuneUp Utilities' considerable features lie within easy reach. You get one-step optimizers--for when you want to follow a click-once-and-then-done routine--as well as in-depth optimizers that let you pick and choose among recommendations. Particularly useful is the TuneUp Utilities' automated maintenance feature, which performs a variety of tune-ups and clean-ups every three days. You can change how the length of the interval between the time it runs, as well as what maintenance to perform. TuneUp Utilities 2010 includes a number of nice new extras, including speed-boosting Turbo Mode--although you should take care when using this feature, and configure it properly. It turns off a number of Windows features; it also makes system changes, such as turning off Windows Aero and synchronization with mobile devices. These might be fine if you're playing a game or working in Photoshop, but it's unlikely that this particular set of tweaks will suit every person at every moment. You can, however, customize what features Turbo Mode turns off. It's worth taking some time to get to know this feature. Also to this version of TuneUp Utilities are tweaking features, such as changing the boot screen, logon screen, and startup logo, changing system icons, and more. Given that this program costs $50, should you buy it? 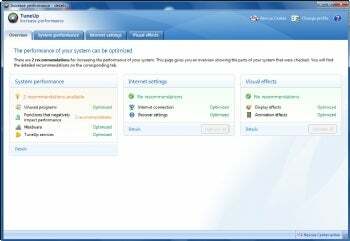 After all, there are many separate, free utilities that clean your Registry, hard disk, and system, and perform similar tasks to those TuneUp Utilities does. But no free utility, not even the excellent CCleaner, does them all,. If you're comfortable with a mix-and-match approach that requires work on your part, you can get by with freebies. But if you're looking for a single do-it-all tool, TuneUp Utilities may well be worth it for you.